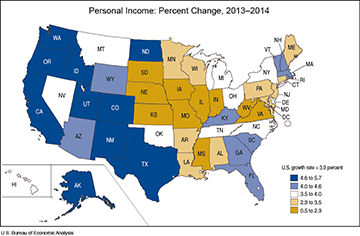 Granite Staters’ income grew by 4.5 percent in 2014 – 12th best in U.S.
New Hampshire led the New England region with the biggest growth in personal income over 2014. That’s according to revised estimates from the Department of Commerce’s Bureau of Economic Analysis, released yesterday. Granite Staters’ income grew by 4.5 percent last year, placing New Hampshire 12th highest in the nation. In New England, Rhode Island followed at 4.3 percent, placing 16th, Massachusetts, 4.2 percent, at 17th, and Vermont, 4 percent, at 19th. Connecticut and Maine placed 39th and 40th, respectively. 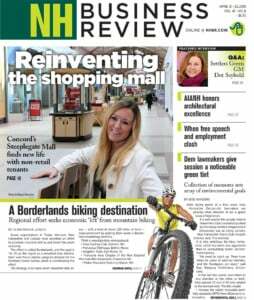 Out of eight regions, New England ranked fourth, with a 3.8 percent growth rate as a whole. The Southwest ranked first, with 5.1 percent growth and the Plains ranked last. By state, Alaska ranked first with 5.7 percent growth, and Nebraska ranked 50th, with 0.5 percent growth. On average, state personal income growth in the U.S. was 3.9 percent, up from 2 percent in 2013, according to BEA. And with inflation at 0.1 percent in 2014, individuals got more bang for their buck. In New Hampshire, professional, scientific and technical services saw the most significant increase in wages, up 10.4 percent. Administrative and waste management services followed (up 9 percent), as well as accommodation and food services (6 percent), educational services (5.8 percent), construction (5.5 percent) and mining (5 percent). The only industry in New Hampshire to experience negative wage growth was arts, entertainment and recreation, which dropped over 1 percent in 2014. The median income in New Hampshire in 2014 was $53,149, the eighth highest in the nation. New Hampshire’s personal current transfer receipts – a sum of Social Security benefits, Medicare, Medicaid and other programs to help the poor, disabled or elderly – grew 6 percent from the last quarter of 2013 to the last quarter of 2014, according to the BEA. On average, personal current transfer receipts grew 4.5 percent in the U.S. Within that grouping, the most significant increase was in Medicaid, up 12.68 percent from the last quarter of 2013 to the final quarter of 2014. Nationwide, Medicaid increases averaged 11.1 percent.